Employee benefits portals customized with your company brand can give your employees easy access to centralized online information about benefits, health and wellness tools, HR policies and procedures, and individual access to health risk assessments and personal health records. You can also maximize HR personnel efficiency and minimize burdensome administrative tasks by cutting down on the time spent providing employees with routine HR information, sending basic forms, and answering day-to-day HR questions. 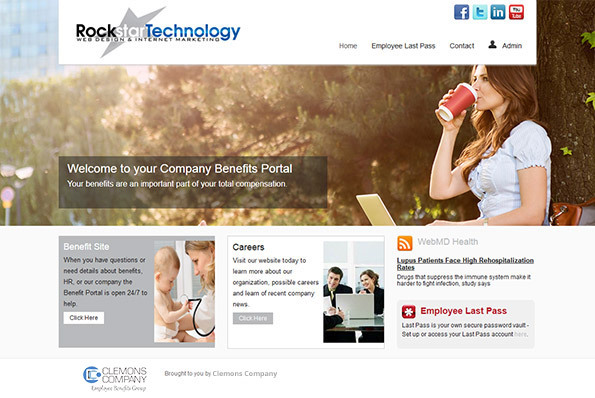 Company-branded benefits portals can be simple in design or structured to automate complex benefits and HR functions. View Custom Portal here and EBC Demo Site here. Companies have very different requirements when it comes to features, functionality, implementation support and price. We believe no one HRIS vendor fits the needs of all companies. That is why we review and test a long-list of best-of-breed vendors. These vendors have a proven record of successful matching up client need with delivery and achieving an outstanding return on investment.